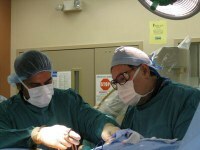 The Pain Medicine Fellowship Program at the University of Louisville is an anesthesiology based, multidisciplinary program. The fellowship is ACGME accredited, at the satisfactory completion of which, the fellows will be eligible for entry into certification in Pain Medicine through the American Board of Anesthesiology. The fellowship is a 12 month program. The primary site of training is the outpatient Pain Management Center, located at the ambulatory care building of the University Hospital. The other rotations include anesthesiology, regional anesthesia and acute pain management, physical medicine and rehabilitation, psychiatry, neurology, neuro-radiology and palliative care medicine. A fellow with residency training from one of the four major specialties does not have to rotate in that specialty. Fellows are expected to achieve a level of expertise that will allow them to function as consultants in pain medicine. 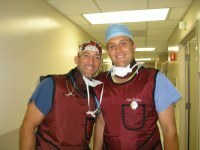 Therefore, the fellows will participate in all aspects of the multidisciplinary pain management. The goal is for fellows to progress from functioning under supervision to, eventually, become independent in performing complex procedures, manage complex chronic pain problems, and be able to function as consultants in all aspects of pain management. In order to reach this goal, active participation of pain fellows is essential. Fellows get ample opportunity to evaluate and manage routine and complex pain patients. 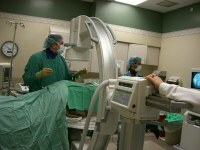 The program is multidisciplinary, however, strong emphasis is interventional techniques. Evidence based medicine, pain medicine, and interventional skills are discussed during the didactic sessions. Since fellows come from different backgrounds, they are encouraged to identify their strengths and weaknesses and work towards improving their weak areas. Faculty members help fellows to become independent pain medicine practitioners. Cadaver workshops for injection techniques and implantation procedures are provided at the fresh tissue lab of the University of Louisville. We accept applications for the pain fellowship through ERAS only beginning this year. We will also be participating in the NRMP match.